Ball Roll is a crucial part of putting, the impact of the putter when it makes contact with the ball occurs with less than a millisecond… In order for the ball to stay on its intended line, it is important to strike the putt with a square face to target line and in the centre of gravity of the putter! 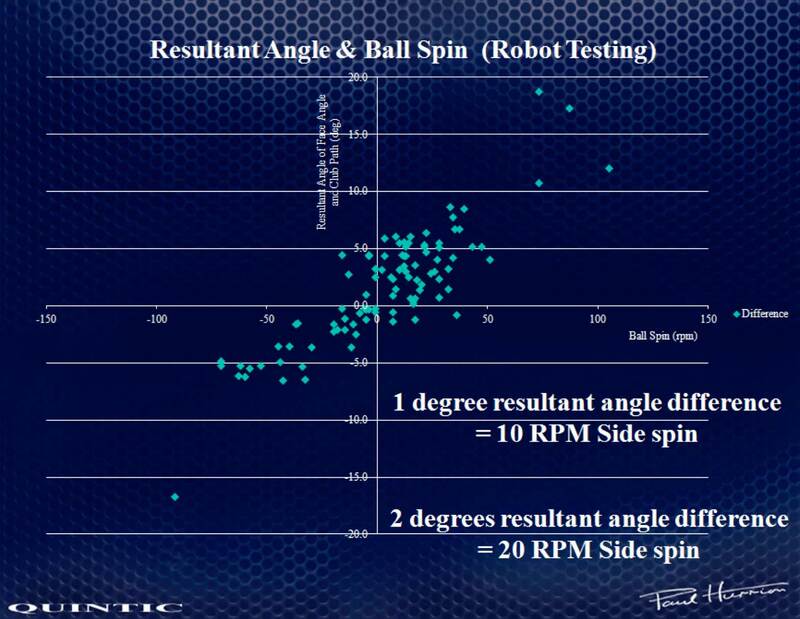 The PH Spin Balls are a very simple, yet effective way to analyse your impact characteristics. 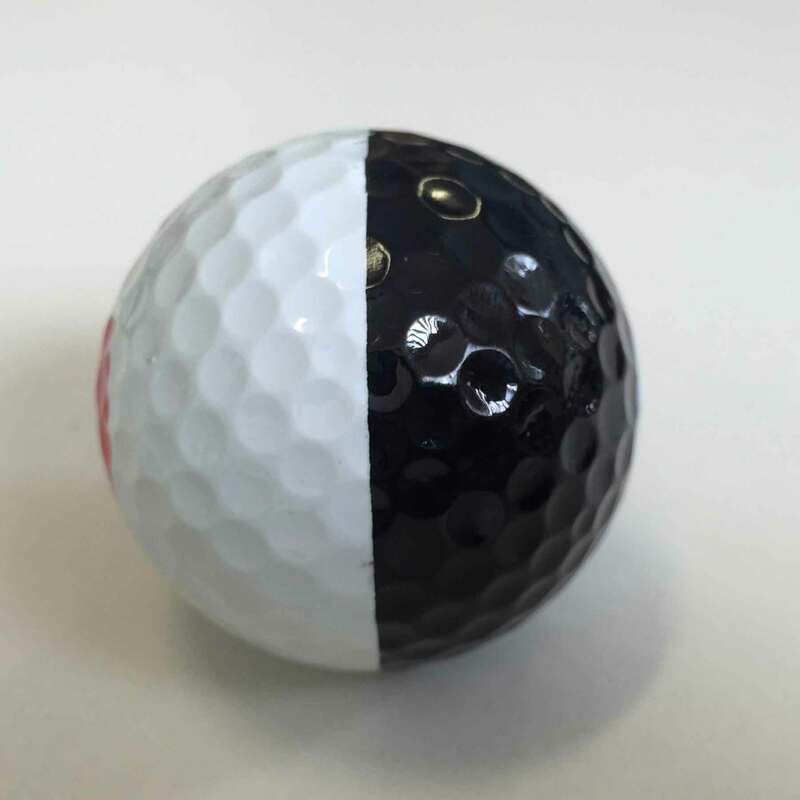 The aim is simple, roll the ball with a perfect over spin motion, there should be no wobble on the rotation of the half black and half white ball. Align the line to your target, make your putt, what is happening to the line, cut spin, hook spin or have you pure overspin? 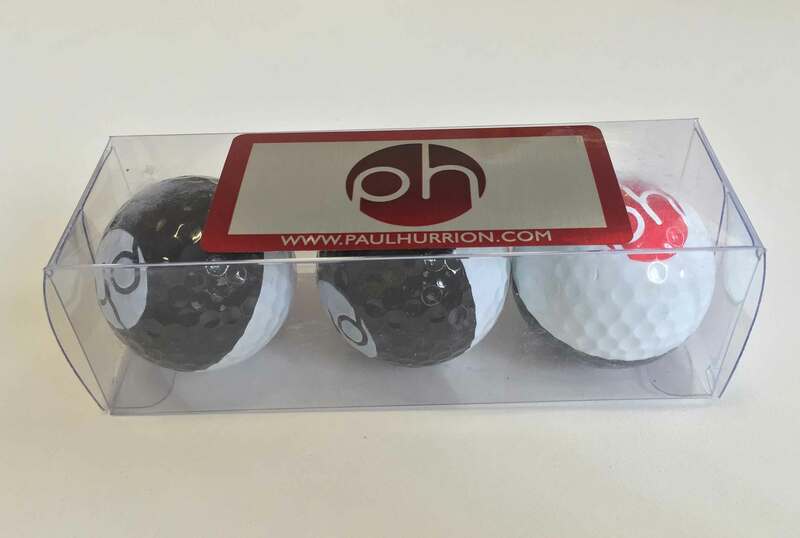 The PH Spin Balls come in a pack of 3. The feel from the putter face is comparable to a ProV1 or similar premium golf ball. Inconsistent Ball Position – eyes often too far inside the line / or ball forward or back in stance? Striking the putt out of the ‘toe’ – putter twists open, creating ‘gear effect’ as a result the ball has hook spin. Striking the putt out of the ‘heel’ – putter twists closed, creating ‘gear effect’ as a result the ball has cut hook spin. There are only three conditions that can occur at impact with the putter and ball. The face of the putter is either open, square or closed to the putter’s path. The number of face angles and paths to make up these three conditions are however, infinite. However, remember that the putter face accounts for up to 92-95% of the starting point for a putter. What happens when there is a miss-match with face and path with the putter? Using Quintic Ball Roll, a software program that utilizes a high-speed camera tracking the golf ball for the first 16 inches after impact. A Quintic research study randomized the putter path by varying degrees, for example, ‘in to square to in’, ‘out to in’, ‘out to square to out’…. along with random face angles at impact. One hundred different face angles and path combinations were used for the study, ten putts were taken with each specific face angle. The average of each set of ten is displayed below in the graph. The putter was released at the same location each time, with an overhead camera used to calculate the horizontal launch angle of each putt, putter path and face angle at impact. Quintic Ball Roll was also used to calculate the launch characteristics of each putt, in particular the hook or cut spin calculations. 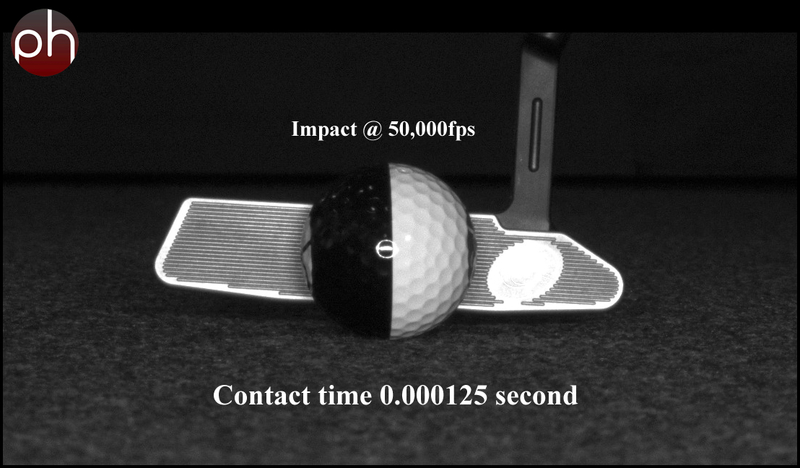 The putting robot was set to create a 1 degree rise angle during impact, with 2 degree of dynamic loft at the point of impact. Only putts struck in the centre of the putter face were used for analysis. Scientific testing using a fixed robot and a high-speed camera (1000fps) has highlighted (Green Stimp 15) that up to 10 rpm of hook or cut spin imparted to the ball is acceptable as having negligible effect. As soon as ‘hook’ or ‘cut’ spin increase above 20 rpm, the spin can cause the ball to bounce and stray from the intended line. From the results presented above, assuming a centre strike, it only requires a two degree resultant angle between resultant club face angle and putter path to impart 20rpm of ‘hook’ or ‘cut’ spin onto the golf ball. For example, the putter face may only be one degree open (will still go in at 8 feet) but having a one degree ‘out to in’ swing path will impart 20 rpm of cut spin on the ball… potentially enough to cause the ball to miss right, especially if on a left to right putt? Once the RPM starts to go above 20 rpm you may need to change the fitting of the putter: for example lie angle, face balanced vs. toe heavy to correct the spin rate without changing the technique of the golfer. However, if you have a SPIN rate greater than 40 rpm, you may need to also fix/address their putting stroke…. Greater than 20 rpm of Cut or Hook spin is enough spin to cause the golf ball to change its intended path (i.e. miss the hole) when putting over a distance of 10ft, especially if it is launched into the air after impact! 5cm out of the toe/heel has an effect on the ball’s start direction. The greater the error in strike, the greater the effect on the ball’s start direction. IMPORTANTLY, the effect of a toe/heel strike on the ball’s start direction varies between putters. Contact location, effects Impact Ratio – which effects Ball Speed? How does clubface rotation affect clubhead twist? The ball only has one spin axis…once it gets to true roll there is no side spin left on the ball!